Disney Cruise plus Marvel Day at Sea? Yes please! If you follow us on Instagram then you already know we were invited to attend #DCLNewYork where we learned about the recently unveiled Disney Cruise Marvel Day at Sea along with general info about all that Disney Magic cruise ship has to offer families. While this event was an adults-only event, we learned so much about the programs, dining and amenities that make Disney Magic one of the most family-friendly cruise ships we’ve ever seen! energy to share our experience with you guys! Don’t forget to check out Disney Cruise Line’s site after you’re done reading our post to learn more or book your family’s future cruise. While traveling without the boys is about as rare as finding a parking spot near the entrance of Target, last weekend Patrick and I dropped them off with their grandparents, made a promise to get as many videos and photos as we could for them and prepared to make a whirlwind trip to Disney Magic alone. Having dropped them off the night before, we stumbled out of bed at 3 am the next morning (if you can really call that the morning), dressed and hopped in the car to head to New York. The drive was roughly 4 hours, most of which I’m not sure either of us really remembers, but we made it there just in time to run from our car through the crazy wind and rain to meet up with our group for the Disney Magic media event. Before we get into our experience, I know many of you are curious about the new Marvel Day at Sea that 7 select routes from NYC will feature in fall of 2017! Much like the Star Wars Day at Sea, Marvel Day at Sea will include a full-day celebration where some of the most popular Marvel heroes and villains will come aboard to celebrate with guests who can meet their favorite heroes/villains, take part in an amazing deck party, test their knowledge in trivia games and enjoy kid-friendly Marvel activities in Oceaneer Club. Our boys (like us) are huge Marvel fans and when we told them about Marvel Day at Sea their jaws hit the floor! We can only imagine how incredibly popular Marvel Day at Sea will be. 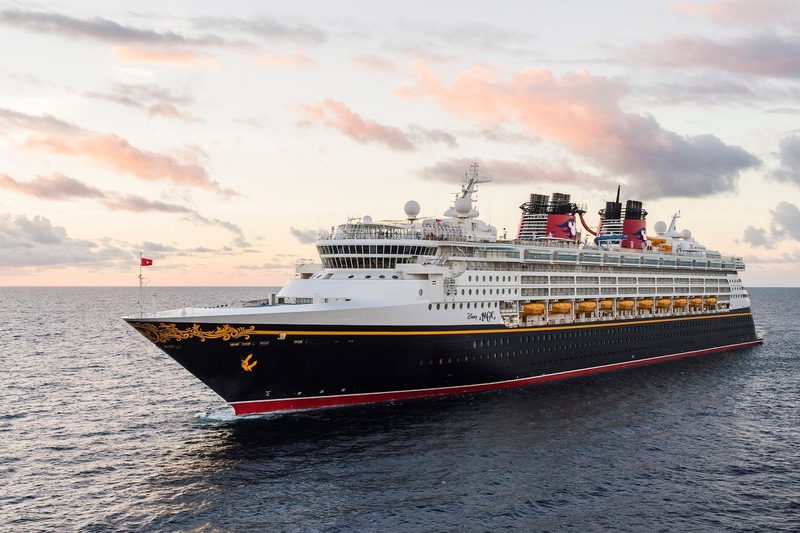 If you’re a Marvel fan and thinking about booking a family cruise next year, definitely check out Disney Magic’s cruise schedule and see if one of the routes featuring Marvel Day at Sea works for your family! We knew Disney Magic was a large ship, but any expectations we had instantly disappeared the moment we came face to face with that mammoth ship. It was enormous! After a little delay getting on the boat, we found ourselves fully immersed in Disney Halloween magic! If you’re like us and enjoy the holidays at Disney, Disney Magic is just as magical as the parks. Halloween decor was in full swing and we spent quite a bit of time soaking it in and trying to capture as much of it as we could for you (if you skipped our video above, check it out!). More on that below! The ship is large and if you’re like me and directionally challenged without a map it was pointed out that signs all over the ship let you know where you are and where you’re headed–thank goodness! With 11 total decks, there was so much to do and see on Disney Magic, I’m not completely sure you could get to it all unless you took part in a longer cruise–which isn’t really a bad thing, is it? Tip: With so many decks to move through, keep in mind that you’ll likely do quite a bit of walking while on board. Bring comfortable shoes and consult a map or staff member if you’re trying to get to a specific destination with kiddos! we turned there was a Mickey or pumpkin or Mickey-pumpkin smiling at us! obviously I watched it decades after it was originally created. This is the Atrium and down below near the tree is where guests first enter when they arrive. Upon arrival, guests’ are greeted and their names are called out amidst cheering! Such a fun way to start a cruise! These lanterns reminded me of abstract pumpkins! I couldn’t get enough of the pumpkin mickeys, they reminded me a bit of the ones on the lamp posts at Walt Disney World! Even the elevator had little touches of Disney Magic! Check that adorable mickey hand. I used to have a watch as a kid with hands just like that! Oceaneer Club is similar to Disney Resorts’ kids activity centers, but with even more to offer! Being on Disney Magic, parents can drop their kiddos off and let them enjoy a little (safely monitored) freedom while they relax. We’re admittedly very cautious when it comes to where our kids go without us (ADHD often means heightened impulsivity and both of our boys have speech disorders of varying natures), but with the multiple security layers we learned were used to ensure kids remain safe and happy, we walked away from the event feeling confident that the boys would be safe at Oceaneer Club. We didn’t have a chance to discuss how staff at Oceaneer Club approach differently-abled children, but we’d love to find out more on that topic at a later date. We’ve had great experiences at Disney Resorts when the kids have attended activities at the kids activity centers, but it’s always something we check with ahead of time prior to booking. We’ll report back if we get more info later on! Disney Cruise Magical Hand Washing – A Germaphobe’s Dream! Our second favorite part of Oceaneer Club was the automatic hand-washer in the entryway. Yes, we’re germaphobes, but this was cool regardless of whether or not you prefer to bathe in Purell while traveling. Definitely check out our video above for a demonstration! Disney knows how to make everything magical–even hand washing! You may be curious as to how you can keep tabs on how your kiddos are doing if you’re 5 decks away. Disney Cruise implements a neat pager system that allows parents to be summoned anywhere on the ship if their little guys want or need them. We loved that! Kids ages 3-12 are welcome at Oceaneer Club, however, it was clear that different areas were geared towards certain age groups, though kids are free to play where they feel comfortable! From what we were told, most kids our boys’ ages tend to cross over into the second half (Oceaneer Lab) where most of the activities are done such as science experiments, cooking, etc. Who doesn’t want to play in Andy’s Room? Mr. Potato Head in the background was killing us! Too funny! This is basically the room of the boys’ dreams! Gotta love the Iron Man suit just hanging out in the corner. Thor’s hammer and Captain America’s shield were also on display! Fancy a trip to Pixie Hollow? Oceaneer Lab is the other half of Oceaneer Club where many of the activities are done! I think this, along with the Marvel area of the main part of Oceaneer Club would be where our kids lived if we took a cruise on Disney Magic. We’ve put the kids in Disney kids activity center events in the past and they’ve always loved it, so I’m sure they’d be even bigger fans of this program! You know how much you love running all over the parks and standing in line waiting for your little guys to meet their favorite characters? Guess what, guys? You don’t have to do that on Disney Magic because characters do meet & greets in Oceaneer Club! Yes, you heard me, you can lay back in the Rainforest room in the Senses Spa while your kiddos meet characters that visit Oceaneer Club if they want! Later on, you can access the pictures they took in Shutters (more on that below) and order ones you/they love. So cool! There are characters in other locations as well of course (we met Captain Mickey! ), so you’ll likely still do some meeting and greeting yourself, but honestly, we love to watch the kids with their favorites so that’s okay with us! While we didn’t get to see some of the other kids-only and teens-only areas, we’ve read there is a sports and recreation activity area called Edge as well as a teen club called Vibe on Disney Magic. There is also a nursery for little ones that aren’t old enough to go to Oceaneer Club. Definitely check these out if your kids are older or younger than ours and you’re curious as to what else they have to offer. It’s important to note that much like Disney Resort kids activity centers, Oceaneer Club will not take your kids to the pool. If your kiddos want to hit the pool Oceaneer Club will let you know and then you can head to the upper deck and hang out in the sun together. At Animator’s Palette you don’t sing for your supper–you draw for it! While we breezed through several gorgeous restaurants on Disney Magic (you can see several in our video above), we had the opportunity to eat lunch at Animator’s Palette, which offered some great dishes and super exciting entertainment! The phrase “dinner and a show” perfectly describes the dining experience at Animator’s Palette. If you haven’t watched our video above, I highly recommend it because we gave you a few sneak peeks! What Animator’s Palette did with drawing they had us create was … magical! The menu was similar to other dining experiences we’ve had at Disney restaurants where guests chose from a moderate selection of items for their starter, entree and dessert. While there was some flexibility in dishes (I swapped out mashed potatoes for cauliflower), we were told that items were pre-made and therefore I couldn’t get the fish, for example, without bread crumbs–which meant the chicken entree was the only gluten-free option for me. On that note, there were several gluten-free menu items and prior to serving anyone servers asked if anyone at the table had any food allergies–good thinking! When they learned I was allergic to wheat they brought out gluten-free rolls for me and pointed out all the gluten-free menu items. They also made sure my gluten-free dessert was brought out when everyone else received their desserts (gluten-free dessert wasn’t listed on the menu, but was available for anyone with an allergy). Not only was service super friendly, but we learned that families/individuals are given the same server every day so that they can remember your preferences and you can feel more comfortable! Different bloggers in our group shared amazing experiences they’d had because of this unique detail. We thought that was so fantastic–and smart! Gluten-free rolls! I didn’t eat them, but Patrick did and he said they were pretty good. This was our starter! That smoked duck breast was really tasty. This was my chicken entree with cauliflower substituted for mashed potatoes (this was the gluten-free entree offered that day). Here’s Patrick’s dessert! It reminded him of some of the yummy desserts we’ve had at other Disney Resorts. This was the gluten-free dessert that day–a chocolate sponge cake with raspberry! I tasted it and it was actually quite good. The pools, water slides and splash pad were on deck 10 and despite the fact the weather decided to pelt us with rain and throw us around in the wind, we got to get a really great look at everything up there! Our guys LOVE water slides and swimming, so I know they’d spend a lot of time up there if given the chance. Don’t forget, little ones do not go to the pool with Oceaneer Club, but parents can bring them whenever they like! Check out that giant screen! It was right above one of the pools so you can watch while you swim. To the left you can see one of the other water slides–the one that goes over the ocean at on point! This area was so cute for the little guys! The first water slide the boys ever went on was at a Disney Resort years ago, I know they’d be down to zoom around this one! Disney Magic offered lots of entertainment choices … shocking, right? Hardly! From parties to shows and plenty of opportunities to meet some of your favorite characters–even Captain Mickey himself–Disney Magic knows how to keep families entertained! We had the opportunity to see Tangled the Music and while we weren’t allowed to take video or pictures, I can assure you it was super impressive! Yes, I may be bias because I absolutely love musicals (my favorite movie as a kid was My Fair Lady), but Patrick was also super impressed so it’s not just for us musical theater junkies. If you appreciate Disney show casting, you’ll appreciate the talent in Tangled the Musical. I thought Mother Gothel (Rapunzel’s evil faux mommy) was particularly well cast and talented! Definitely see it if you have the opportunity because … wow! While I couldn’t take pictures of the actual show, I did shoot some video of the beautiful interior of the theater before the show started. Check it out in our video above! Have you ever been to Grand Floridian at Walt Disney World? If you have, you may have at least heard of Senses Spa (located in the resort). While a phone call is the closest I’ve gotten to experiencing their services (my favorite skincare had gotten destroyed during our flight and I was hoping they had a good alternative), I’ve never had time to venture inside, though I’ve heard it’s amazing. Disney Cruise actually has the same spa as the one at Grand Floridian and you bet your bottom dollar I’d make sure to stop in (and actually experience a few of their services) at least once if we sailed with Disney Magic because it looked fantastic! They offered everything from salon services to couples massages; teeth whitening to a sauna. It was really lovely inside and definitely designed for relaxation, which Patrick and I could certainly use a little more of. We even toured the Rainforest room in our video, which was absolute tranquility. If you’ve ever used Disney’s PhotoPass or Memory Maker you know how absolutely awesome and effortless it is to get great shots in the most picturesque locations of the parks or with Disney characters. And best of all (at least to me), you don’t have to carry around your DSLR to get them! Disney Cruise has its own picture program where you can get your pictures taken by professional photographers around the ship and with characters, then order them at Shutters’ interactive kiosks. You can even access any pictures your kids take while in Oceaneer Club with characters as well! I’d gone back and forth in the past on purchasing Memory Maker, but after giving it a shot (pun intended) a year ago we found we actually loved it! We would totally utilize Disney Magic’s photography services on a cruise because who wants to lug around their camera while relaxing aboard that beautiful ship? Those interactive kiosks allow you to view your picture and select ones you wish to purchase. Patrick and I aren’t big drinkers, but when we were offered the chance to take part in a mixology class we thought–why not? I’m glad we did! It gave us an opportunity to see what Disney Cruise offers adults while their kids are busy having fun at Oceaneer Club. Disney Magic has seven lounges and clubs where adults can go to socialize, grab a drink and share some adults-only time. Our mixology class was held in Keys, which was modeled after old Hollywood piano bars. It was cute and the mixologist that led our class was hilarious! Despite not being the biggest drinkers we had a great time and learned how to make some drinks we’d never tried before. Honestly, even if you’re not a regular drinker it’s worth checking some of these spots out while the kids are busy just to see what they have to offer! While we only spent about 7 hours aboard Disney Magic, we were incredibly impressed with everything we saw and did! It is absolutely on our bucket list now and the kids are beyond excited after watching all the footage we brought home for them. We actually have a little surprise video we haven’t shown them yet (waiting until they’re better) in which one particular Marvel hero has a special message just for them! Stay tuned for that in a later post. We love surprising these two, which I’m sure you’ve gathered if you watched us surprise them with a trip to Disney for Mickey’s Very Merry Christmas Party last year or this year when we surprised them with a trip to Disney for Mickey’s Not So Scary Halloween Party and shared it on Instagram Story (video coming soon!). If the thought of a Disney vacation excites the stuffing out of you (like it does us), then you will lose your mind over the magic inside Disney Cruise ships. Everything from the decor to the characters; food to activities was exactly what you’d expect of a Disney experience. Basically, take any Disney Resort, exchange the rides for water slides and put it on the ocean and you’ve got Disney Magic! Plus you get to go to different ports and enjoy all of the fun in store there as well! *sigh* So much travel fun. If we get the opportunity to go on a Disney Cruise in the future we’ll be sure to share that experience in depth, but for now we’re happy to share what we learned during the media event we recently attended. We learned a lot! As with every Disney experience we’ve had in the past, it was apparent that Disney Cruise Line took great pride in the biggest and smallest details of what they had to offer, especially for families. Don’t forget, Disney Magic will be back in NYC in 2017 and Disney Cruise Marvel Day at Sea will be on 7 select routes leaving NYC starting next fall. Have you been on a Disney Cruise? 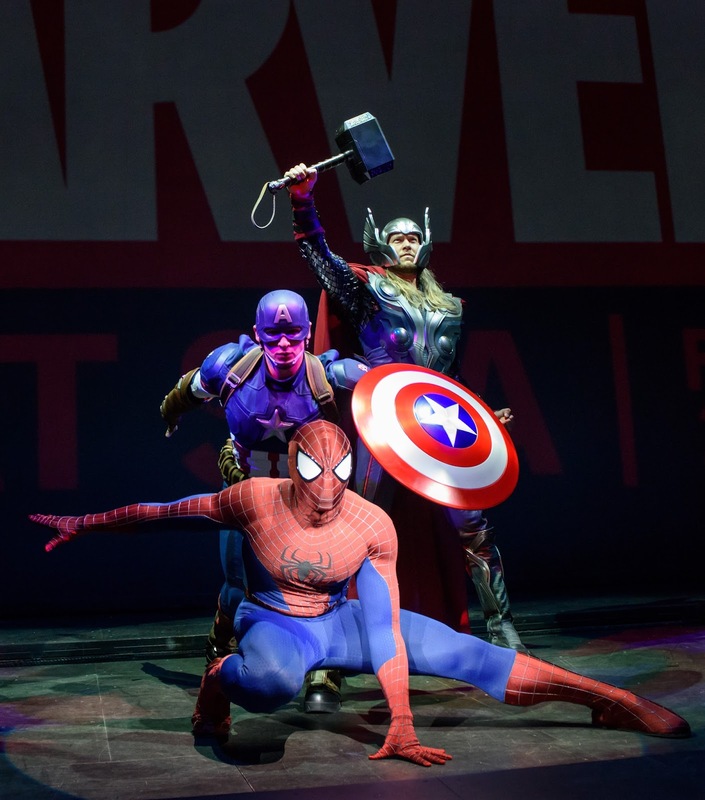 What do you think of the announcement regarding Disney Cruise Marvel Day at Sea? Check out Disney Cruise Line’s to learn more or book your family’s future cruise. Note: Information shared above was attained during a media event hosted by Disney Cruise. All opinions are our own and information is subject to change. Check out Disney Cruise’s website for official info on their ships, amenities, etc. This looks awesome. I would love this cruise. It was super cool and there were so many adult-only things to do on top of the general Disney family fun! Oh my gosh! I love all of the Halloween decorations and themed rooms! Looks like such a fun cruise! This is so descriptive! So much more info than most blogs I see! And the photos – OMG! This looks so freaking amazing! Aw thank you! I'm glad you thought so, we tried to include as much info and visuals as possible–it was amazing! Oh I can't wait to take a Disney Cruise with my kids one day. Its totally on my bucket list! I love this! I had no idea the dining was great for even grown ups. I kind of feared it would be geared more toward children. This is really nice! Yes! Disney Resorts (and now the cruise) in general have been some of the places we've been to that tend to have the most gluten-free alternatives without too much hassle in our experience, which is so nice! We were there, too! What an amazing ship! I would love to take my family on the Disney Magic at some point. It sounds like you had an incrediable time during your hours aboard the Disney Cruise Marvel Day at Sea. I would love to do this some day. We are also big Marvel fans. There is something for the whole family and it really does look magical. Thanks for sharing your experience. Going on a Disney cruise is a bucket list item for me. A marvel disney cruise is something I bet even my teens would love. The pictures are awesome and now I want to go even more! This looks like such an awesome experience. I would love to go on a Disney cruise some day. Especially once our little girl is older! Disney cruise? Sounds pretty amazing, I have never been on a cruise. Sounds fun! The ship (Magic) was pretty amazing! Omg you made me feel like I was there. I want to go so bad now! Time to plan my next vacation! Aw thank you! You're so sweet 🙂 I hope you get to take that next vacay soon! Disney cruises SO magical. I was on one years ago and have been dying to go on another ever since. A friend of mine went on her first Disney cruise this summer and said although it was expensive, it was SO worth it! That's awesome! Yes, we've blogged a lot about how we believe budgeting realistically for your family is key when it comes to enjoying Disney. The nice thing about the cruise vs. the resorts is that dining is included along with Oceaneer Club, which at the resorts actually accounts for a decent portion of our usual spending! I'm jealous – looks like you great time. Disney is notorious for great service. We live in Florida so we are near the cruise ports. 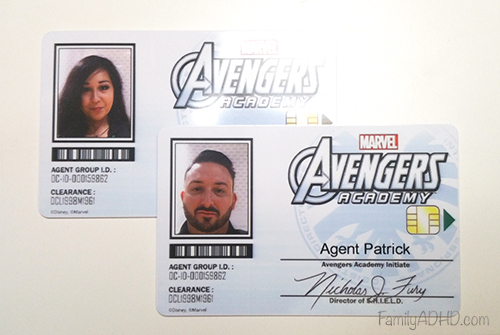 We hope to get on the Avengers themed one soon! My little dude would love it. WOW! You can't go wrong with a cruise like this. It's amazing and it's definitely something that will make the kids really happy! They'll be excited to see their favorite superheroes at sea with them. I want to go on a cruise so bad and a Disney cruise is looking more and more perfect. I think this would be amazing and the event looks like a lot of fun and delicious food!